Treasury Inversion and Political Fed Cycles - Technical Traders Ltd. - Investment Strategies, Analysis & Intelligence for Seasoned Investors. Take a look at this chart that highlights the current and previous US Federal Reserve FFR rate changes. It is quite easy to see that consumers and business, on the receiving end of these changes, often swing from one extreme to another as the US fed makes these dramatic moves. And, yes, that last 2400% number is correct. The FFR went from 0.06% to 2.4% over the past 3+ years – do the math yourself if you don't believe us. Let's talk about how the US economy operates as a host to the global economy for a second. When the US economy is booming, it exports growth, opportunity, and activity to the rest of the world. When the US economy is contracting, it exports contraction, diminishing opportunity and slower economic activity to the rest of the world. This may be a bold statement to make, but it is true. For the past 80+ years, the US economy has been the “mothership” of the global markets in terms of creating and exporting growth and opportunity for foreign nations. The US Fed, therefore, has an incredible responsibility to safely navigate the current and future global expectations with regards to FFR levels and yield levels as the global economy expands and contracts with political, trade and social issues. It is a very difficult process to navigate for anyone. 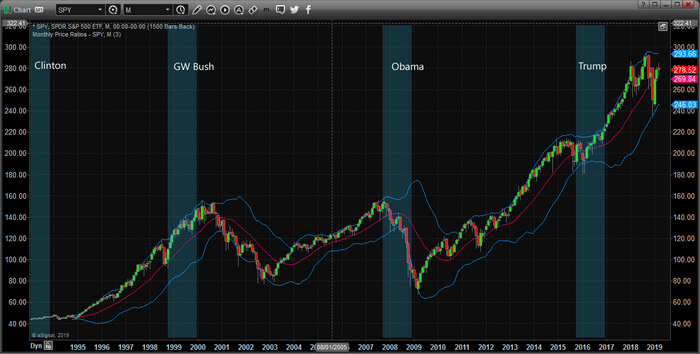 US Presidential Election cycles also play an important role in how these expansion and contraction cycles take place. Anyone with any understanding of Music understands each note includes an “Attack” and “Decay” process. The same thing takes place in economic cycles. Within the Attack phase, the economy builds strength, capability, and output, just as the musical note does. Within the Decay process, the economy begins to wain in strength, capability, and output, just as the musical note does. The process within the global economy is very similar to an orchestra of musical instruments playing difference components of the music output. Some play loudly and dramatically, others play softly and more demure. The outcome is a finely balanced and enjoyable musical presentation. The global economy is very similar to this and right now we are starting to see a slower, softer period of economic activity throughout the global economy. Currently, the US is starting a new Presidential Election cycle where dozens of Democrats are lining up against President Trump. This is sure to be a battle that will rival “Rocky II” in terms of scale and scope. It is also starting far earlier than most normal mid-term Presidential election cycles. This is one of the biggest reasons we believe the Treasury yields may stay rather muted for the next 12+ months while the end of the “attack phase” plays out for the global economy. Eventually, the “decay phase” will begin within the global economy and we'll start the process of waiting for the US Fed and central banks to rally opportunity with lower rates and possibly QE ventures. We've highlighted the US Presidential Election “run-up” cycles (the hyperbole 16-month process that takes place before the actual elections) in BLUE on these charts. It is fairly simple to see that the combination of the US Fed rate levels, US political controlling party policies and consumer sentiment related to these policies and economic factors have driven yields higher or lower throughout the past 50+ years. In fact, the US and the Globe have recently transitioned from more of a regionally localized global economy to more of a centrally functioning global economy. One thing has not changed, though, the US is still the largest of the global economic drivers and will continue to be for the foreseeable future. When we take into consideration how these yield contractions have resulted in asset price changes in the US stock market, we need to compare these moves in yield with the expectations of traders, investors, and capitalists throughout the world. Remember, the US stock market is currently, and has been, a pool asset valuation protection for global investors throughout the planet. Over the past 40+ years, the US economy has exported opportunity and capacity throughout the globe while global investors have continued pour capital into US stocks, Bonds and Debt because of the strength of the US Dollar. Our expectations are that the yield inversion, much like the inversion near 1980/1990 is the precipice of a renewed economic expansion as the planet develops new 21st-century trade, economic and political ties while shedding the 19th-century shackles that are currently binding it to obligation and debt originating from the 1960s through 1980s. This transition period may be fraught with some dramatic price swings in assets, stocks and economic output levels. Yet, we believe the outcome of this process will be a fantastic opportunity for skilled traders to find and execute tremendous upside pricing opportunities once it completes. We have been completing a series of market cycle research that focuses on the alignment and timing of core global cycles. By our research, 2027 and 2048 are key years for the global markets. We believe 2027 will likely be a breakout year where the global markets align for an incredible upside price increase and we believe 2048 could be the year that the global economies exhibit some type of “metamorphosis” in terms of capacity and function. In short, we believe these current inverted yields are nothing more than a “symptom” of the current political and US Fed FFR interest rate climate in combination with the current global economic output capacity and consumer sentiment. To put it simply, after the US Fed raised rates by 2400%+ and the current trade and political issues are still unresolved – where do you expect yields to be moving? Right, into further contraction while the US Fed tightens monetary policy and consumers react by tightening their spending. Once the trade issues are resolved and the US Fed adopts a bit of easing in terms of current rates, we may continue to see have another year of wild and choppy market condition much like 2015, and 2018, but that all depends on what type of resolution there is with the current trade issues. We'll keep you informed of our research and longer-term date cycles as we continue to extract more concrete data from our research. If you like our research and can clearly understand the value of having a team of dedicated market technicians and researchers working for you to help you find and execute better trades, then please visit www.TheTechnicalTraders.com to learn how we can help you. This US presidential election cycle is going to have top billing for the next few months – get used to it and get used to the fact that the markets and yields will likely do what they always do within these cycles – muted price rotation where underlying fundamentals and consumer sentiment will likely drive future pricing. Stay tuned and watch precious metals.